At Microsoft, we’re committed to helping businesses capitalize on the enormous opportunity that The Internet of Things presents, but since the term “IoT” covers so much terrain, we understand it can be hard to know where to get started. There are often numerous questions about security, standards, and deployment, and the two big problems we get asked to solve for is: where do you focus your attention when it comes to IoT and where do you start? 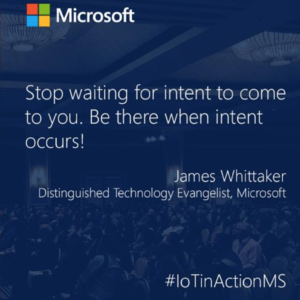 At the IoT in Action event we held in March in San Jose, we spent time talking to IoT experts within Microsoft and at partner companies like Arrow, Avnet, Advantech and others, as well as system integrators, ISVs and OEMs, who are solving for these challenges today. We asked them for their thoughts on how to get started with an IoT solution. Read below on what they had to say and register for a new IoT in Action with Microsoft event in Boston on Oct.30th to see what’s possible with IoT, get educated, and find the right partners to start build your own IoT solutions. So, choosing a partner that can show you the way their platform works and how it can be integrated into your everyday business process is crucial. Does it need a consulting partner? What devices and machines need to be connected? And what happens to the data once it flows in? Delve into our IoT site on Microsoft.com to find information, case studies, white papers, and educational videos that will help you understand IoT better and help you make informed decisions on what to do next. Every company has a core strength. Find yours and you’ll be able to generate actionable data and learn from it. How do you identify your core strength? Ask yourself what vertical you play in, what type of customers you serve, and what they need that an IoT solution could cater to. A large number of IoT initiatives don’t have a plan that defines what it’s going to look like in the end, who your audience is, and how you’re going to monetize your IoT platform. You need to decide early if the purpose is for cost savings, new revenue models, or increased customer engagement. Once again, ask yourself, “What’s my value proposition and what do I bring to the table?” There are a lot of different applications within IoT, so you should be able to articulate your value to your ecosystem partners and be able to find ways that you can turn those elements into a viable solution. The IoT industry leaders we spoke to suggest that winners in IoT will always be those who gather, analyze, and understand customer intent and can predict what they might do next. For instance, while you can get data and analytics on how many times someone walks into your store by installing an in-store sensor, it’s another thing to interpret that data to get inside the head of the customer to understand why they are there and what they might do next. The best place to begin before you start to figure out your customers is what your end goal is. It’s not enough to have the latest piece of hardware or software; it’s what you do with it. There are lots of paths to get you to where you want to go, you just have to figure out a final destination. These range from IoT operating systems that fit your device of choice or large, robust cloud services that gives you the bandwidth and security your product or service requires. Which one serves your needs? Once again, it’s important to partner with the right people, whether it be a gateway provider, a cloud partner, or an integration partner who understands the area you want to pursue. Once you know your niche, you’ll start to gather the right team to help you excel in your business with the end customer in mind. The best way to commit is to start with a goal in mind: are you going to increase revenue, try to save costs, or engage customers? Then, commit! Once you commit on the enterprise level, you’re ready to find other partners that exist in your ecosystem that are ready to commit with you. Given the success of the IoT in Action event we partnered with ReadWrite in March 2017, we are doing it all again on 10/30 in Boston. 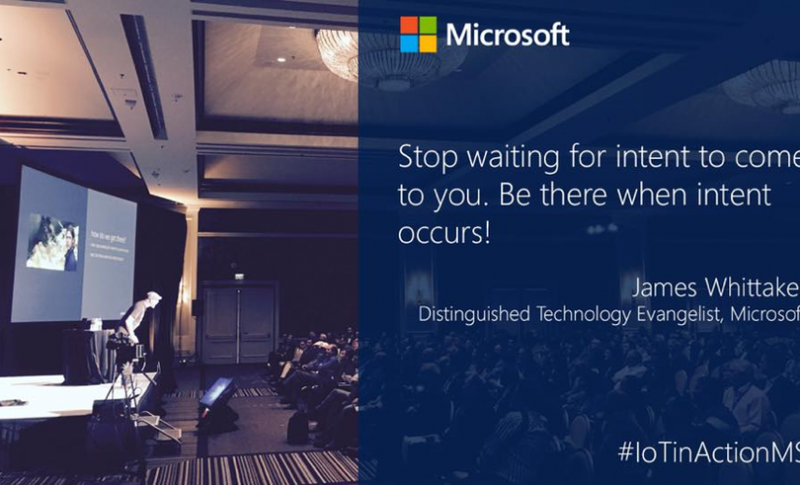 Register for IoT in Action with Microsoft in Boston and learn where else in the world you can connect with IoT ecosystem partners to take action on IoT.